Fresno State Chrome Helmet Authentic | Sports Memorabilia! 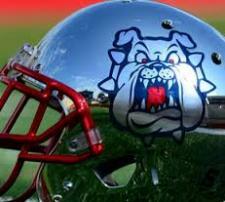 This is the 2014 Fresno State Chrome Football Helmet, the authentic model as being used on the field. 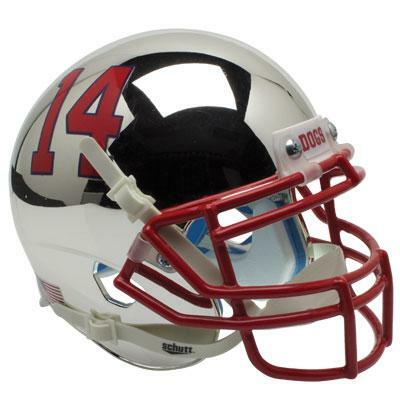 This is a great looking helmet with a silver chrome finish and the Bulldog face on the left side of the helmet, the #14 on the right side of the helmet, a green and red "V" on the rear of the helmet, the word "Dogs" on the front nose bumper and a scarlet red facemask. Manufactured by Schutt. This Fresno State Chrome Football Helmet is available in the authentic model, the full size replica model and the mini helmet version. The Fresno State helmet is also available in a red, white and black helmet as well. Please allow 5-10 working days for product to ship.